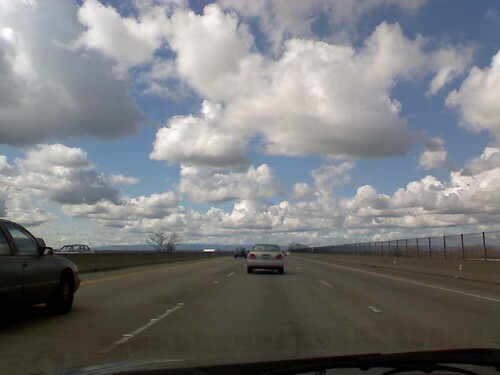 I love how these clouds frame my drive home on the westbound lanes of I-80. I just finished with my AM show and prepping for tomorrow’s show. I’ve left behind the buzz, stress, laughter and the rest of the roller coaster ride of emotions back in the newsroom. Rick Dees on 102.7 FM once said it took him 30 seconds to forget about his morning show. He said that was about how long it took him to take off his headphones and make it out to his car in the parking lot. For better or worse, it helped him stay sane in the broadcast industry. In the car, I have my iPod plugged into my stereo. I’m grooving to some tunes from Coldplay’s Vida la Vida and catching up with podcasts by the Washington Post and This American Life. I’m enjoying the sun and the clouds on the freeway. I’m looking forward to cuddling with my puppy at home. After a solid block of sleep, I’m ready to take on the next day in the newsroom.